As a vein specialist, Dr. 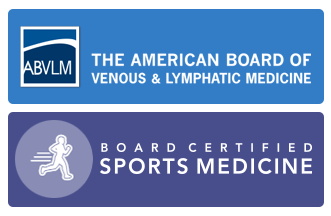 Darling is accredited by the American Board of Venous & Lymphatic Medicine and Board Certified in Sports Medicine, a fellowship sub-specialty and a dermatology provider for 18 years, uniquely positioning him to have a better understanding of your venous/vascular condition and associated skin disorders. He is also a Registered Vascular Technician (RVT) and Registered Physician in Vascular Interpretation (RPVI). Dr. Darling is a member of the American Venous Forum, American College of Phlebology and the American Academy of Cosmetic Surgery. Providing exceptional care while using the latest pain-free methods available, he answers your questions and concerns with clarity and respect. Prominent superficial forehead veins, sub-orbital veins and temporal veins, while not life threatening, do require cosmetic intervention when the person needing treatment does not have an underlying medical condition. We offer treatments that range from conservative options, such as compression, to advanced surgical treatment including, microphlebectomy, ambulatory phlebectomy, high ligation, EVLT & sclerotherapy. SCHEDULE YOUR VEIN SCREENING TODAY! PUT POWER BACK IN YOUR LEGS!